It's March, and only a week or so into the official change of season - perfect timing to begin planning. A new three-month period, full of potential and opportunity is upon us, ready to be designed to suit you. The new season can be an ideal time to consider what you want from your life. But not necessarily on a large-scale (after all, it's not New Year!). Rather, consider how do you want to feel in 3 months time? When the season changes again, what would you like to have achieved or done? As regular readers know, I am a frequent listener to the podcast Happier with Gretchen Ruben. Many months ago, they were discussing the idea of designing your summer. (I also wrote another post about this previously - you can read it here). 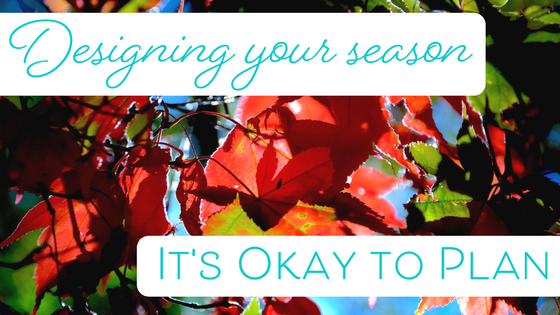 As a quick refresher, designing a season is about planning ahead for a 3-month period around how you want to feel, and what you'd like to do or accomplish. After listening to the podcast (which was all about designing a summer), my thoughts have frequently returned to this concept. It got me thinking that surely we could design any season or any time to make the most of it, and make it memorable. It's not only applicable for summer! For me, designing and planning any period of time around what you want to achieve, or how you want to feel seems like a fun way to break up the year. Autumn in Australia, particularly in Sydney where I live, is still warm and very mild. We generally have warm, sunny days but cooler temperatures overnight. But I know for my northern hemisphere friends, its early Spring - with the new growth, flowers and longer days that brings. Here, during the three-month period of autumn, we have a fortnight of school holidays plus a separate long weekend for Easter. So, it seems a perfect opportunity to consider, how do I want to feel through this Autumn season, and what would I like to have accomplished by the end of it? Can I tackle a bucket list item during this time? Do I want to have changed a habit? Or taken a trip? Fortunately the weather here does not hinder my intentions and desires! In my time in the corporate world we often spoke of 30, 60 and 90-day plans. The idea being that when we set goals with a shorter timeframe, we tend to maintain our focus and achieve them. The seasons, being three months, are perfect examples of 90 day plans. However, we needn't be in a corporate role to apply this approach. With a ready-made three-month (90 day) time period thanks to the season, it's an opportunity to dream, design and plan how we want to feel for the next few months, knowing we have a greater likelihood of achieving our goals simply due to the enhanced focus of the shorter timeframe. When I think about the coming three months, and how I want to feel, and what I'd like to achieve, it comes down to three key areas. I know I want to spend some quality time with my immediate and extended family over the Easter long weekend and during the school holidays. I'd love to travel to see my siblings too. For my health and wellbeing, I know I'd like to travel out of the city and spend time in nature, with walks in the bush/forest and by the ocean. I'll be visiting my favourite beach too, before the water gets too cold for swimming. I also know that there may be some courses or books I wish to immerse myself in or learn from. My aim is by the end of the three months of Autumn, I can look back and feel that I have marked the season with a particular achievement, tone or flavour. These are all things I'm still pondering. But it feels exciting to contemplate how I can use the months of March, April and May in a very productive, positive way that will lead me to enter June feeling renewed, energised and (perhaps) even better educated! The temptation to curl up on the couch, watch Netflix with the kids and eat a lot of chocolate (Easter eggs, yum!) will be there, but it will be up to me to decide to do something different and not give into temptation all that often. Designing is a bit like dreaming. So, I'm hoping that by thinking ahead and actually PLANNING the season, I will feel more committed to truly embrace the joy of life and make these desires happen. Planning for me means getting the diary out and locking in dates. It can also mean finding an accountability buddy to help me move these ideas from dreams into action. If this idea appeals to you, and you like the concept of making a season feel different, then why not give it a try? It might not feel right for you now, but you could try it for winter/summer, or next spring/fall. The idea is timeless, and can be applied whenever you feel you'd like to acknowledge a period of time in a different way. Whatever you decide, designing and planning your season is a fun way to differentiate a period of time in your year. Changing your routine and achieving some new goals can also make you feel more productive and happier. Both of which sound good to me! I love to help people plan and live their dreams - and I'd love to help you! Book in for your complimentary consult and we can chat about how we can work together.